The plantar fascia helps support the arch of your foot. It is a thick band of tissue located at the bottom of the foot and connects your heel bone to your toes. 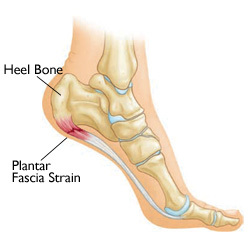 Plantar fasciitis is when the plantar fascia becomes weak, swollen, and inflamed. Pain usually occurs with your first steps in the morning when you get out of bed or after sitting for a long time. Then the stiffness and pain decreases as you move more, however the pain may come back after long periods of standing. People who walk, stand, or run for long periods of time are more likely to have plantar fasciitis. People who have high arches, flat feet, or tight Achilles tendons or calf muscles may experience plantar fasciitis. Overall, it is important to wear well fitted shoes and shoes that are not worn out.